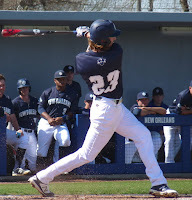 After beginning by upsetting the tournament's #1 seed, dropping a winner's bracket game to Houston Baptist in the wee hours of Saturday morning, then coming back to beat HBU on Saturday afternoon, the Privateers finally fell to Northwestern State, 7-5, in the tournament title game. With its entire pitching staff running on empty, New Orleans went to Bryan Warzek, who threw 110 pitches in Thursday's victorious start, but Warzek was roughed up early as the Demons took a 4-2 lead in the second. NWST extended the lead to 5-2 before the Privateers fought back with a three-run fifth to tie the score. William Griffin extended himself way beyond his comfort level in relief, pitching effectively over 4 2/3 innings and 79 pitches in his first appearance of the tournament. But Griffin was taken deep in the seventh by David Fry, the SLC Player of the Year, and the Demons retook the lead at 6-5. Northwestern State added another run that inning to conclude the game's scoring. Orynn Veillon concluded the season with a 3-RBI performance, keeping the Privateers in the hunt all night. UNO finished 29-32.